Hotels aren’t as simple as they used to be. 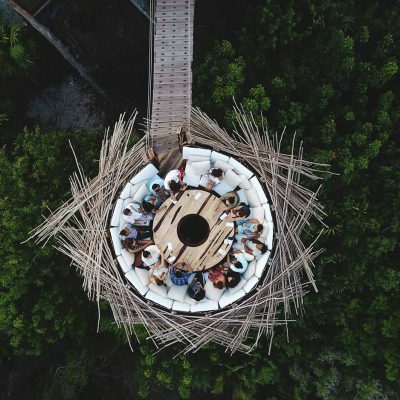 The best have evolved into performance spaces that allow guests to star in their own sort of theatrical production — to try on a whole different life, if only for one night. In Part 1 of this series, we explored how outstanding interior design has elevated hotels, helping them evolve into a kind of performance space where guests can try on a different life. The old saying might still be true that wherever you go, there you are — but we know that environments like these can’t help but change a person. Travel is transformative — otherwise, what’s the point, right? Our examination dives deeper into that question here in Part 2. Part 2: The Inside or The Outside? When Tablet first launched, a sort of glossy minimalism was the prevailing boutique-hotel look. But lately a more lived-in, comfortable, and easy-going style has been in the ascendant. Think of it as a 21st-century version of the Victorian era’s ornamentation and deliberate mixture of styles, but in a way that looks not formal, but practically effortless. 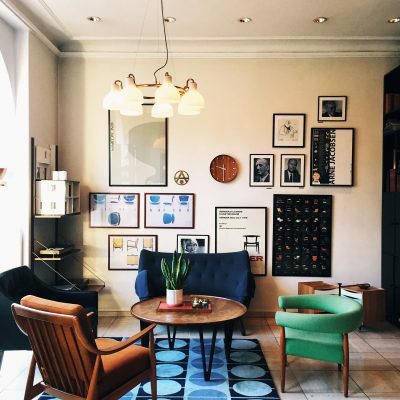 You’re staying a while, so these hotels make sure you have plenty to look at while you do. Palihouse West Hollywood takes this whole “try on a new life” thing literally. It’s an extended-stay hotel, with interior spaces that aren’t too different from those professionally crafted Los Angeles apartments you think only exist in the movies. The design is plenty stylish, but still down-to-earth and approachable. Like Hollywood’s most successful performers, it’s attractive and charming, yet comes with a necessary bit of humility. 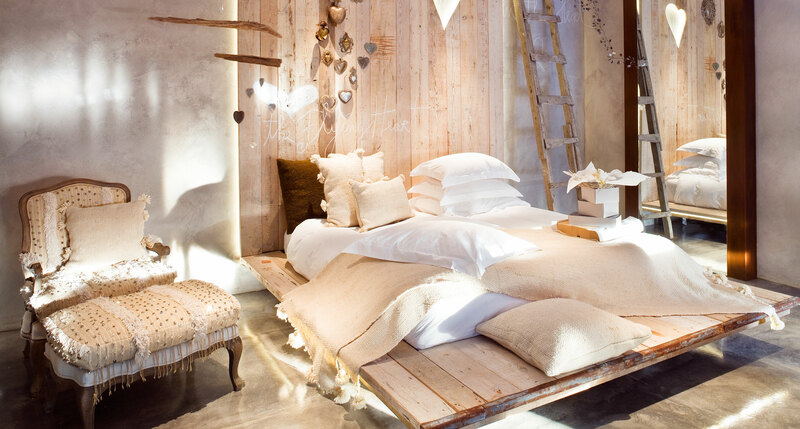 In Portugal you’ll find a similar combination — and also an awful lot of driftwood, as if to say these meticulously designed boutique hotels simply washed ashore one day, looking every bit as stylish as they do. A reminder that holidays are for making it look easy. 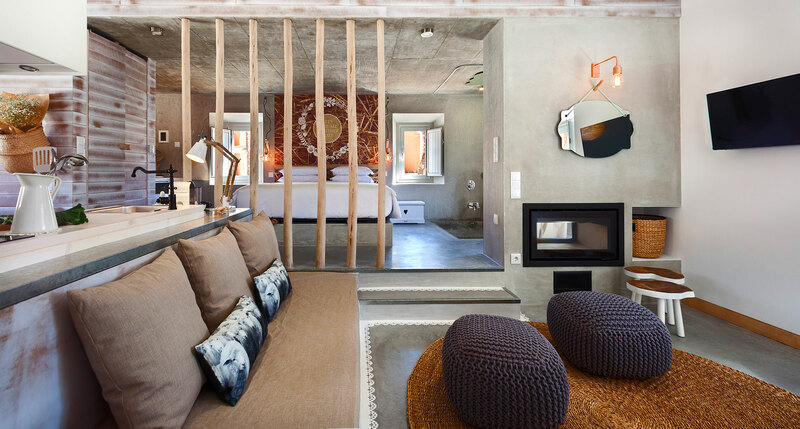 And in case it wasn’t clear enough, Areias do Seixo Charm Hotel & Residences and the Luz Charming Houses practically explain their purpose in their names. Relaxed comfort is the main objective of both hotels, with rustic fireplaces in every room of the former, and smart little kitchenettes in the cottages of the latter. 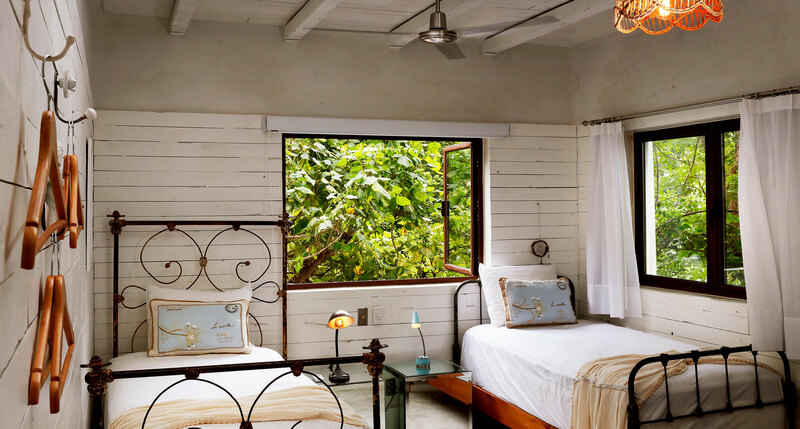 Unfortunately, a rough-and-rustic style isn’t exactly common in Playa del Carmen, but Hotel La Semilla makes a compelling case for why it should be. This is a Mexican beach town, after all — the atmosphere of glittery striving you find at some of the region’s most populated resorts should be the last thing you want here. The fit and finish at La Semilla isn’t perfect, and it isn’t supposed to be. 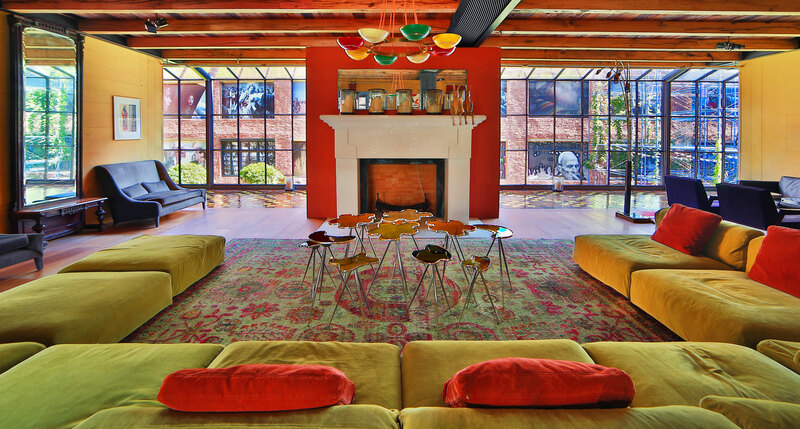 The owners prioritized character, eclecticism, and a highly personal touch over flash, polish, and pizazz. Sounds perfect to us. While much of Palm Springs understandably leans on the disciplined mid-century modernism it helped make famous, it is still an oasis amidst a wild natural environment, surrounded by mountains, deserts, hot springs, and even a breathtaking national park. We’re all for the contrast, but Sparrows Lodge goes in another direction, paying tribute to the Coachella Valley’s more rugged features. 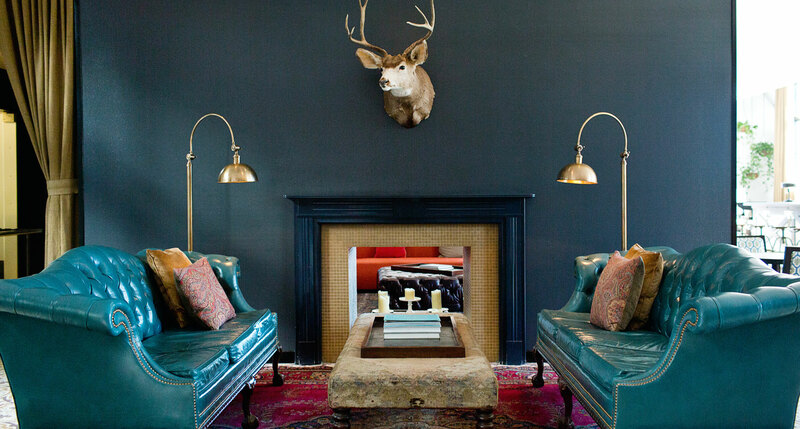 The feeling is distinctly outdoorsy, like a ranch or summer camp, albeit a chic and upscale version. There’s a lot going on in the rooms at the Rooms Hotel, and we mean that in the best way possible. It’s further evidence of the post-Soviet renaissance of Tblisi, the seductive capital city of Georgia. Leather and wood, steel and glass, velvet and terra cotta — it all blends together seamlessly to provide a lavish getaway that’s bold and colorful, but never inelegant. Perhaps the most influential purveyor of this trend, at least in the hotel world, is the incomparable Liz Lambert. 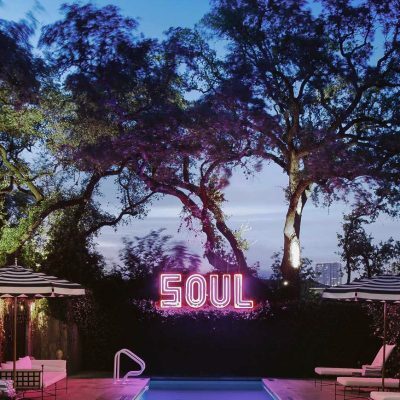 The game definitely changed when she opened her Hotel Saint Cecilia and showed just how eager guests were for accommodations that provided a high level of intimacy but didn’t break the bank. 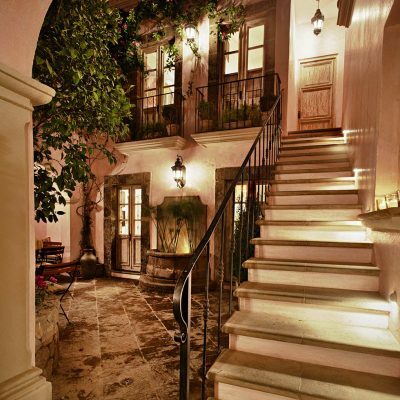 The result is a luxury-level guest house that’s hand-crafted, impeccably curated, and second to none. Some hotels keep you thoroughly entertained with their interiors, but what about when the exterior offers a level of entertainment that no human touch could possibly match? That’s when the first priority of the design should be to provide a worthy frame for the view. These hotels try to do just that, drawing your eye away from the inside and out into the world. The irony is that these hotels are actually all so impressive on their own that you wouldn’t mind if they looked straight out at a brick wall. 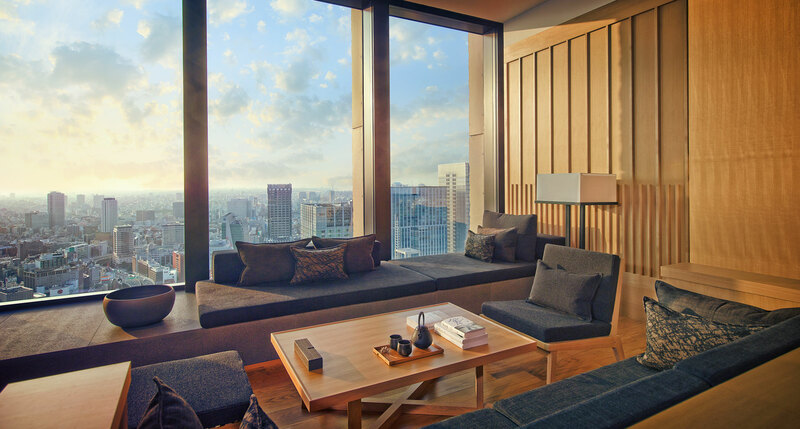 But Aman Tokyo, for all its interior charms, is only made greater by its vertiginous city views. The hotel’s modernist rooms pay tribute to the traditional Japanese experience — the warm, golden tones would be right at home in a ryokan, and provide a calming contrast to the bustling blue-gray city some 30+ stories below. 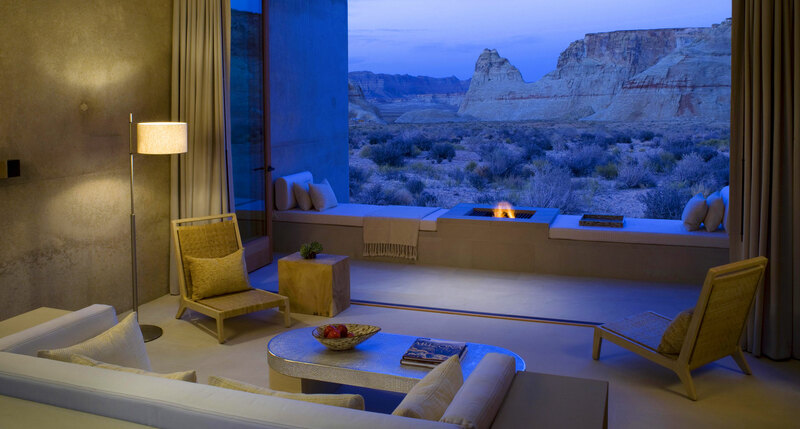 Aman uses minimalism differently at Amangiri, their Utah outpost, located just outside of Lake Powell. Here the interiors mirror the exteriors, with concrete walls, rough timber furnishings, and windows that open so wide it’s almost difficult to tell where the inside ends and the outside begins. It’s a sensible choice. After all, you didn’t drive this far into the desert to avoid the feeling of being detached or to spend half your day hiding from the otherworldly landscapes. When it comes to incredible views, nothing beats a bit of blue. 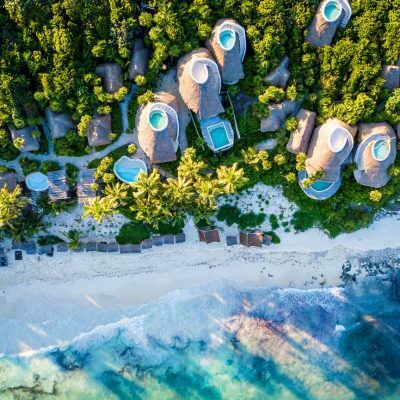 The three hotels above look out over three impressive seascapes, and show three impressive ways of supporting a killer view without receding too far into the background. 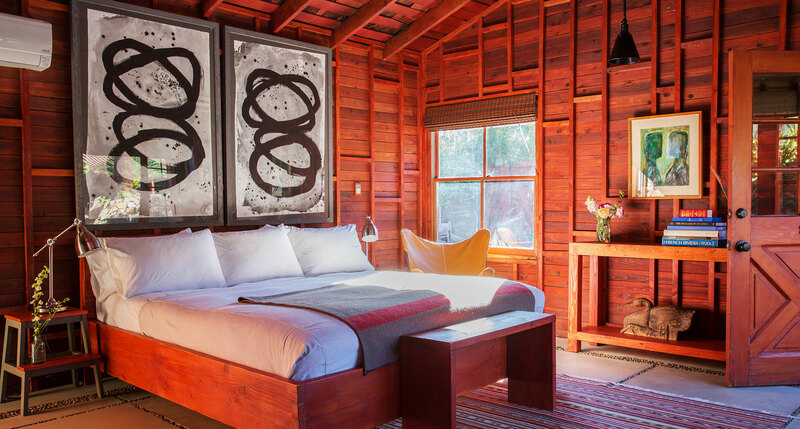 Hotel San Cristobal occupies a highly desirable bit of real estate in Todos Santos, a hip fishing village on Mexico’s Baja Peninsula. Sitting right on the Pacific, its beachfront rooms frame a scene that’s almost Rothko-like in its blue and white abstraction. This is another Liz Lambert joint, and her easy-going style is again on full display — so much so that you might be content to nap all day on the couch instead of journeying to the ocean, just a few steps away. Similarly, Aigialos in Greece takes that satisfaction a bit further, allowing you to play out the fantasy of having your own antique-furnished eighteenth century villa on the cliffs of Santorini, waking up each morning to panoramas of the Aegean Sea. 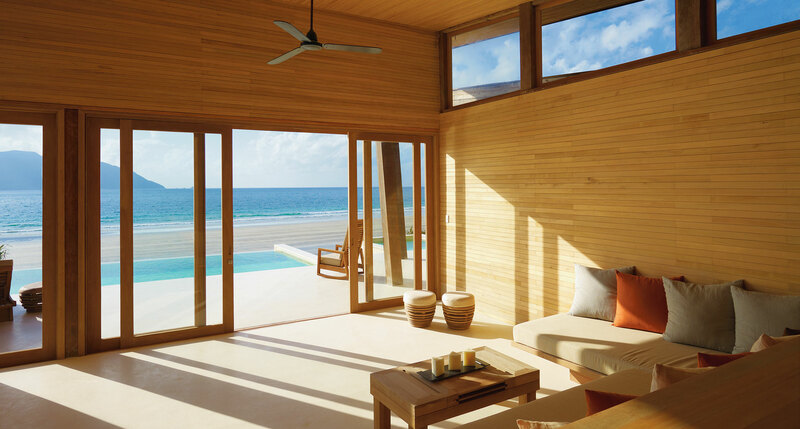 If your preference is for something more modern and less casual, Six Senses Con Dao presents a spare, uncluttered scene. But make no mistake, there’s quite a lot going on behind the scene at this fully sustainable, fully luxurious resort — especially when you pair those breezes from the East Vietnamese Sea with your own private butler. Perhaps when you think of incomparable views you think of water in a different form: the kind that caps the tops of jagged mountain peaks. There’s no shame in that, in two uniquely different ways. 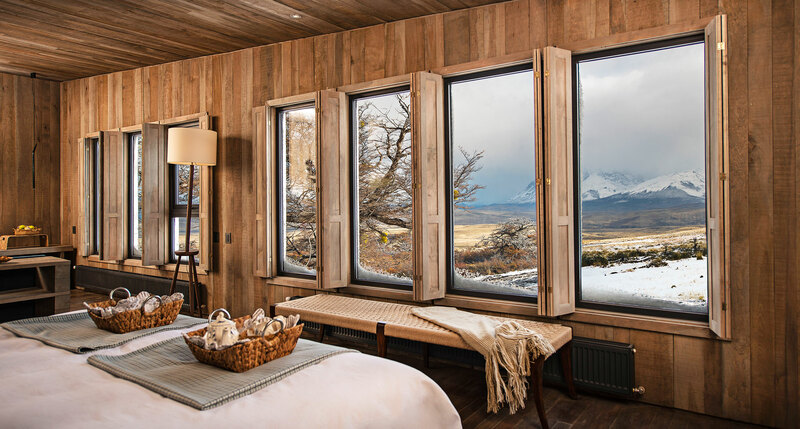 We spend a lot of time thinking about the seclusion found at Awasi Patagonia, and you should too. This is quintessential cabin living — the absolute perfect balance of remote rustic charm and modern gloss, with just the right amount of luxury. Nothing is unnecessary, and everything works to reinforce the impossible views. It is, almost literally, a dream. 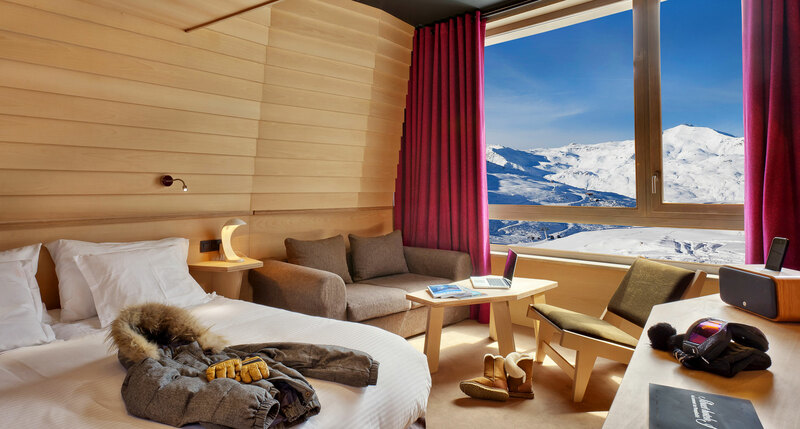 Set in the French Alps’ highest-altitude ski resort town, Altapura trades solitude for glamour, taking the materials of a classic ski chalet — wooden beams, animal furs, even taxidermy — and refashioning them into something that somehow looks post-modern, and feels both cushy and cutting-edge. It’s a delicate dance, and at no point does it ever distract from the main event happening just outside the oversized windows. And finally, when you can’t hope to compete with what’s outside, you might as well just bring the outside in. 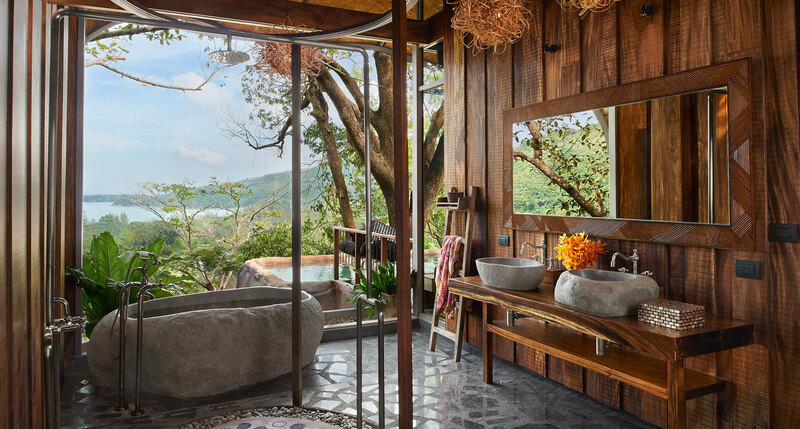 That’s what they’ve done at Keemala in Thailand, creating what is essentially a tree-top wonderland of elegant dwellings that almost completely blur the line between canopy and accommodation, granting bird’s-eye views that look out over the forest to the Andaman Sea beyond.